CAMP LUKBAN, Catbalogan City – “Let me assure everyone that the Internal Peace and Security Plan (IPSP) ‘Bayanihan’ programs implemented by my predecessor shall be pursued”, said Brigadier General Gerardo T Layug AFP, the incumbent Commander of the 8th Infantry Division. He stated his commitment as he assumes the task of sustaining the momentum of support to the development of Eastern Visayas. Since the start of the year 2011, with the launching of IPSP “Bayanihan”, the 8th Infantry Division has embarked on programs to promote human security, good governance, and development in the Region. The command was able to realize these programs with the partnership of stakeholders from both the public and the private sectors. 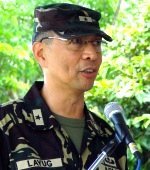 Having recognized the gains in the Region, Brigadier General Layug, with his experience in both local and international peace endeavors as community developer in the country and peace builder in war ravaged nations aided by the United Nations, made sure that everyone under his leadership understand his intention to enable the Region’s stakeholders to steam ahead with their gains in development. - Build disaster mitigation capability to help people in disaster-prone areas in their time of need in disaster prone areas in the Region. After issuing his specific guidance, he followed this up with Command visits to line units to ensure that his message would be understood by all personnel of the Division. With BGEN LAYUG AFP, who is committed to pursue the path to peace and development at the helm of 8ID providing sterling leadership to the Command, the people of Eastern Visayas are assured of Team 8ID’s commitment to secure the region and serve its people onward to “Winning The Peace”. QUEZON CITY – A new alliance of some 40 major trade unions and labor federations have united to advance trade union and workers’ rights in the Philippines. “After a series of in-depth discussions, we, the leaders and members of major labor and trade unions and workers' organizations in the country have mutually decided to be united by embracing our diversity,” said the group in a statement during a media conference in Manila today. “In the face of the prevalent anti-worker environment and given our diverse ideologies, methodologies and approaches, our unions have continued to champion workers’ right to organize, to collectively bargain, to hold strikes and to engage government in social dialogue, but with limited success. We believe that the Filipino workers can be empowered again by, first and foremost, united action among unions and workers' organizations.” NAGKAISA said. “We are forming the coalition called NAGKAISA, which will consistently and passionately work towards restoring the right to full protection and the chance to live a decent and dignified life for all Filipino working men and women – whether formal or informal, private or public, here or abroad,” the group added. “If necessary, NAGKAISA will be holding decisive mass actions to bring these issues closer to and wield support from the people,” the group said. NAGKAISA will hold a rally on Labor Day in Manila, where it plans to mobilize some 40,000 workers. PASAY CITY – Senate minority leader Alan Peter Cayetano said that what is far more important than forming or joining coalitions at this time is for the voters and candidates to be assured that the improved automated system will further deter any attempt by known political operators to tamper with the results. He said he is closely monitoring preparations for the 2013 national elections particularly the extent of progress in the ensuring that automated elections will be safe from fraud. “As long as we have an automated election that is fair and with no possible intervention by special operators, whatever coalition one belongs to wouldn’t really matter,” he said in response to questions about his preferred political coalition. “So far, there have been no indications of this happening and it looks like everything is proceeding on time,” he added. The senator also pointed out that the nature of political campaign in the country has already drastically changed due to the advent of information technology and social media – a fact that prospective coalitions and candidates should seriously consider in their campaigns. “With so many friends on Facebook, one can already campaign for himself. President Obama showed us the way in not only getting support but also in raising money through the internet. The political parties have to realize that the campaigns can no longer be run the way it used to be run in the 60s,” he said. The minority leader said social media has increased the capacity of politicians to reach out to their constituents and vice versa. “Before, the only way you can participate is through your organized networks and representatives. But now with Twitter, Facebook, and the online versions of the major dailies, reaching out has been made so much easier,” he said. In this light, he called on the administration to be mindful of how quickly public opinion can change even as he expressed the thought that political leaders should not rush into forming coalitions this early. QUEZON CITY – Some 150 human rights advocates, religious, church people and bakwit, or internal refugees or internally displaced persons (IDP) from Visayas and Mindanao, will gather at the National Conference on Internally Displaced Persons or Internal Refugees on April 23-24 at Jansenn Hall, Christ the King Seminary. Bakwit is a colloquial Filipino term from the English word “evacuate,” pertaining to victims of forced evacuation. Led by the National Council of Churches in the Philippines (NCCP), KARAPATAN (Alliance for the Advancement of People’s Rights) and the Ecumenical Mission for Peace and Development (EMPD), the IDP Conference is a response to the growing number of internally displaced persons in areas where there is intensified militarization. According to Karapatan, there are a total number of 6,556 victims of forced evacuation under the Aquino administration’s counter-insurgency program Oplan Bayanihan. “Violation to the right to domicile is not the only violation experienced by internally displaced persons. When they are forced to leave their homes, they lose their livelihood because they abandon the land they till. Children’s schools and places of religious worship are also converted into military camps, thereby violating their right to education and right to freedom of woship,” said Cristina Palabay, Karapatan spokesperson and End Impunity Alliance convenor. Karapatan documentation revealed that recent cases include the forced evacuation of 158 families, or at least 800 individuals including children in Ansili and Maribuhok in Sitio Zapanta and Manhumapay, all in Kitcharao; as well as in Stio Lusong, Brgy. Puting Bato, Cabadbaran City, both in Agusan del Norte. Majority of those affected come from the Mamanwa tribe, an indigenous people group in the CARAGA region. Some other 300 individuals, meanwhile, are still in an evacuation center in Butuan City. Internal refugees will share their stories in the conference, including the threats and harassment they experienced in the hands of the military. Among the delegates is Maricel Salem, a volunteer teacher at the Center for Lumad Advocacy and Services (Clans) located in Upper Suyan, Malapatan, Sarangani Province, an alternative school which gone on and off in its operations because of threats, harassment and intimidation to children, their parents and the Lumad in the community. Sharon Liguyon, wife of slain indigenous people leader Jimmy Liguyon will also attend the conference. Jimmy, who was killed in March 5 2012 inside his residence in San Fernando, Bukidnon, is an active opponent to the entry of large-scale mining in the area. Their community has been heavily militarized since. MALACAÑANG – President Benigno S. Aquino III has directed all government agencies to turn over their existing original and copies of films and other audio-visuals to the National Film Archive of the Philippines (NFAP) as part of government’s efforts to preserve the country’s artistic and historic wealth. Republic Act No. 9167 created FDCP under the Office of the President. Among FDCP’s powers and functions is the establishment of the film archive in order to conserve and protect film negatives and/or prints as part of the nation’s historical, cultural, and artistic heritage. MANILA – Vice President Jejomar C. Binay Friday urged the housing sector to involve slum-dwellers in the decision-making process in projects for slum upgrading and sustainable urban development. During the National Informal Settlements Upgrading Strategies (NISUS) Conference at the Manila Hyatt Hotel, Binay noted that decision-makers and stakeholders are resistant to upgrade policies because of their negative perception of informal settlers. “This (NISUS conference) is about shifting paradigms to collectively generate doable solutions to the urban housing problem,” he said, adding that such change should involve the empowerment of the beneficiaries of slum upgrading. "Kailangan nating bigyang dignidad silang mga kapos sa yaman. At dapat na sa pagbibigay nito, kabahagi sila mula pagplano hanggang pagsasagawa ng mga programa at proyektong laan para sa kanila, at hanggang pagtalaga ng mga responsableng taga-monitor ng progreso at pagtatapos ng programa at proyekto," Binay emphasized. Binay cited examples of successful applications of informal settlement upgrading strategies which, according to him, attest to the possibility of effectively implementing the NISUS. Among them are the Upscaling Urban Poor Community Renewal Scheme (UUPCRS) and the Urban Partnerships for Sustainable Upliftment, Renewal, Governance, and Empowerment (UPSURGE), which were initiated by the Partnership of Philippine Support Service Agencies Inc. (PHILSSA). UUPCRS highlighted the effectiveness of community-based and demand driven approach. UPSURGE, on the other hand, showed the success of LGU-NGO partnership and incorporation of shelter concerns into the city development plan and government structure in informal settlement upgrading projects. "When communities are fully involved in the identification, design, and implementation of projects, they prove to be effective partners in informal settlement upgrading work," the Vice President attested. The NISUS conference was part of the preparatory activities leading to the development and adoption of the informal settlement upgrading strategy in the Philippines. In May 2011, the Housing and Urban Development Coordinating Council (HUDCC) chaired by Binay entered into a partnership with Cities Alliance to implement the NISUS. The Cities Alliance granted HUDCC with US $455,000 to develop a strategy that would provide reference and support the key thrusts of the government in developing sustainable communities and the formulation of a National Government Resettlement Policy. The NISUS project will also support the implementation of the 2011-2016 Philippine Development Plan by promoting awareness, involvement, ownership, accountability, and partnership in informal settlements upgrading initiatives among the concerned stakeholders. This will help LGUs identify policy and program options for local informal settlements upgrading that should be integrated into the local planning documents such as the Comprehensive Land Use Plan and Comprehensive Development Plan. The NISUS conference featured Andre Bald, Senior Infrastructure Specialist from the World Bank, and Anaclaudia Rossbach, consultant for World Bank on housing and metropolitan governance, who talked about informal settlements upgrading in Vietnam and Brazil, respectively. Meanwhile, local speakers included Mayor Sherwin Gatchalian of Valenzuela City, National President Ofelia Bagotlo of the Homeless People's Federation Philippines, Inc., and Wilfredo Prilles Jr., coordinator for the City Planning and Development Office of Naga City. MAASIN CITY, Southern Leyte – Having a transparent conduct in practically all aspects of operation has been a routine practice of the Department of Public Works and Highways - Southern Leyte Engineering District (DPWH-SLED). This was emphasized by District Engr. Carlos Veloso in a press conference with local media held at Agas-Agas, Sogod, recently. For one thing, Veloso cited the monthly interaction of his office with members of the local media as a way of sharing updates and information that would be disseminated to the general public in the form of news reports through print, broadcast, and online media. As to bidding of public works projects, Veloso said the procedure now being used has been e-bidding or electronic bidding, where any qualified and interested bidder can submit a bid up to the last minute for a truly competitive bidding process. “Unlike before, there will be no advertisement for a certain project without any approved plan yet,” he added. He also disclosed several safeguards were put in place to insure quality control and this was routinely carried out at the district and regional levels. For the DPWH-SLED alone, there was no peso disallowance so far found out by the Commission on Audit (COA) as all transactions were aboveboard, Veloso claimed. “I urge you to check our work,” Veloso appealed to local media practitioners, an apparent invitation to cross monitor progress and quality of development projects implemented in the province. Veloso stressed he has always adhered to the motto of DPWH Secretary Rogelio Singson, which states that projects must be done at the right cost, right quality, and finished right on time. BORONGAN CITY, Eastern Samar – Land Transportation Provincial (LTO) Chief, Nars Tabarnero reported that the government assistance to Eastern Samar drivers through the Pantawid Pasada Cards (PPC) are now ready for withdrawal at the Caltex Gasoline station. According to her, there is an amount of P2,150 for each card. The first P1,060 was for the November 2011 allotment and the second P2,150 is for the March allotment. She advised therefore the card holders to withdraw the 20-liter gas for each allotment lest the amount is reverted in six-months that it is stale. As of this writing some 19 drivers have already withdrawn the government fuel assistance. Asked why Caltex Gas Station would be the sole provider of the PPC which is owned by Mr. Sonny Uy, the LTO Chief said that it is the only one which had been newly accredited. Ms. Tabarnero thanked Caltex for the support extended to the government project on the PPC as one mitigation approach to ease up the drivers burden on the high cost of fuel. She also cited that a second phase of the same program might be provided, however, some guidelines have to be ironed-out first. CATBALOGAN CITY – To make sure that jobless Samarnons earn income, Samar Governor Sharee Ann Tan shelled out some P218 thousand for livelihood training for some 115 Samarnons interested to earn. According to TESDA Samar Chief Cleta Omega, on April 19, some folks from Sta. Rita town will be trained on hair cutting until April 26, 2012. Trainers were handpicked by TESDA to ensure that the best trainer teach at least 20 Sta. Rita folks. On April 24 - May 1, another batch of Samarnons, this time 25 from Pagsanghan town will be trained on manicure-pedicure craft. TESDA said that massage therapy training will also be done in Basey to benefit some 30 Basaynons determined to have an income. As for Marabut town, another 25 mostly women will benefit from a manicure-pedicure training in the near future. As for the capital city of Catbalogan, some 20 folks will be trained on massage therapy and foot spa. The governor said in an earlier interview that it will provide skills training for Samarnons who wish to start their own livelihood. Free training supplies and equipments will be provided and starter kits will also be given for the trained Samarnons to start earning and become productive citizens of the province. BORONGAN CITY, Eastern Samar – A 4-WD Tractor was handed over to Eastern Samar farmers through Honorable Governor Conrado Nicart, Jr. The simple ceremony was done the other day, by Department of Agriculture (DA) Regional Executive Director Antonio Gerundio. This is line with the number one agendum of Nicart’s leadership on agricultural production in order to achieve rice sufficiency in the province before he bow out of office. Fully aware of the big agricultural potential of the province, the governor, who himself farms “Palay” and maintains a wide array of fruit bearing trees, immediately convened the municipal agricultural officers shortly after he was sworn in to office. With this tractor, it is hoped that better plantation and increased “Palay” production could be derived by the farmers, so there would be no need to import rice from other regions. Reports said that some P1M fund had been extended by DA Regional Office 08 for the procurement of the tractor, with the province’s counterpart. It added that the tractor is aimed to likewise generate income as it would be availed by government recognized farmers association. Provincial Agriculturist, Regal Opena opined that the province would also venture into corn production to supplement rice as staple food.